Sweet potatoes are one of the easiest to grow vegetables, provided you have the right climate. Florida is perfect for sweet potatoes. They like the heat, they like the long summers and they don't need much care. 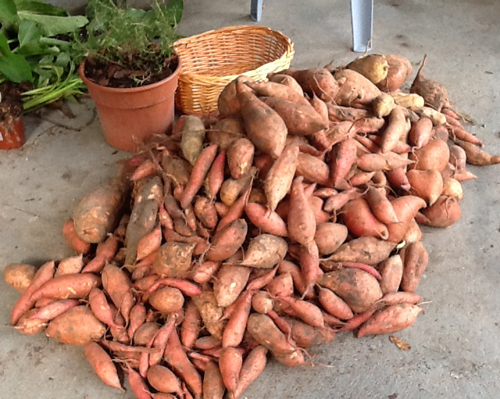 To learn how to plant sweet potatoes, read on. Step 1: Get Your Planting Material! This isn't hard. 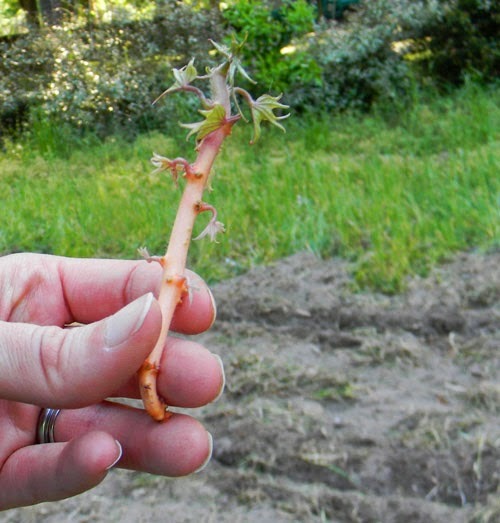 Sometimes your local feed store or nursery will sell "slips," which are just rooted segments of vines. This is a really easy way to get started, but if you have a little more time you can make your own sweet potato slips like I teach you here. You can also simply buy a bag of sweet potatoes and start burying them in the garden... or take chunks of vine off an existing plant and start plunking the stems a few inches deep into the ground. Rachel broke this chunk off a sweet potato in the pantry. It's perfect. I've done all of the above with good success. Think of them like ivy: they root at every node easily. Water them for a couple of weeks and they'll take off. Generally, we eat most of the big sweet potatoes through the winter and keep a basket of the smaller ones for planting in the spring. It doesn't matter that they're small. Unlike individual fruit or vegetables, the sweet potatoes we harvest all contain the exact same genes as the big ones we ate so there's not a problem with "selecting" for tiny roots. They're clones! You don't have to worry too much about preparation for sweet potatoes. 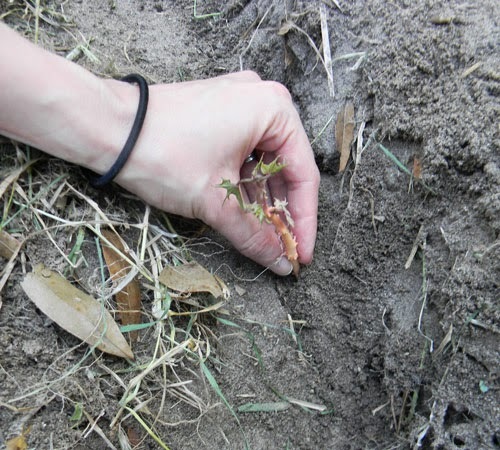 Loose, loamy soil is great... but they'll also grow in so-so sand without many complaints. 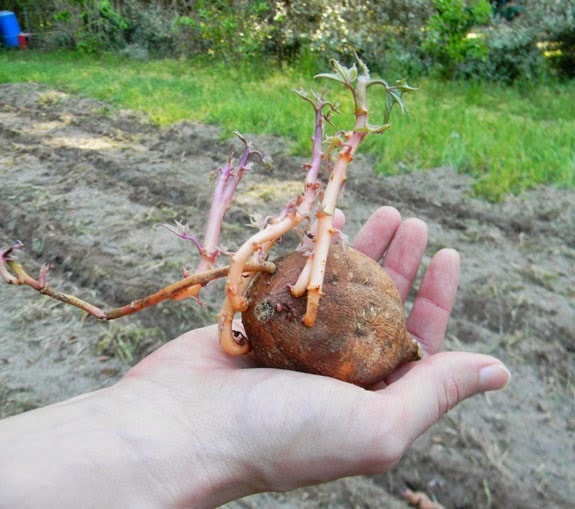 The vines are shorter on this sweet potato so Rachel planted the entire root. This year, we're growing in our former white potato bed. They're not related species so there's no danger of disease build up in the soil. This is pretty lousy area that generally fails to yield well, so we're going with our drop-dead easy survival staple this time around. We'll see how they do. I covered the area in fall with a mixture of rye and lentils as a green manure cover crop. Cover crops add nutrition to the soil and keeps it "alive" between plantings. I dug three trenches about 4' apart after tilling, then we planted the sweet potatoes at 4' apart down the trenches. Rachel covered this piece of vine with dirt all the way up to the leaves. We should get plenty of sweet potatoes from this planting... plus we always miss a few that pop up again the next spring after the frosts leave us alone for a while. Step 3: Water Well... and Stand Back! Sweet potatoes will take off in warm weather and need little to no irrigation in years with decent rainfall. They also tend to run over most weeds and control the area where you plant them... and the areas around the garden... and the areas beyond that. I have them coming up 20' from where I planted them last year. My kind of plant. This sweet potato yielded at least five good slips for planting. If you haven't planted your sweet potatoes yet, it's time to get going. You have until about June, but they'll be a lot bigger and happier if you start before the weather and bugs get too intense. 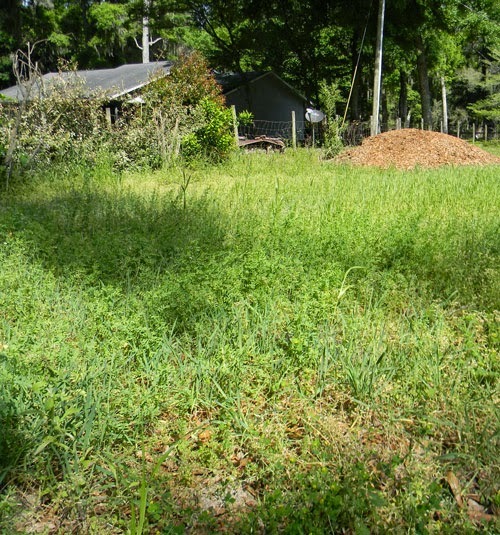 As a final note - sweet potatoes make a great ground cover for food forests, especially in the more tropical areas of Florida where they'll grow year round. As a bonus, the longer you leave them in the ground... the bigger the roots tend to get. 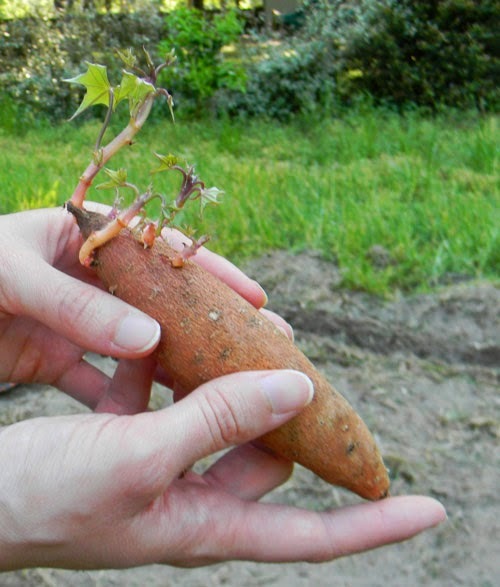 Sweet potatoes are easy to grow and easy to plant. Get to it! I keep telling myself I need to try that.I think I will,this year.Thanks for the how-to. When you've killed as many vegetables as I have, you start to pick things up. Great timing on this article...I ordered 36 "slips" on line and they are due in any day now. Guess I should get my tiller out and go to prepping the soil! It's my first time trying sweet potatoes. How long will the vines get and how will I know they are ready for harvest? The vines can grow 20' or more, depending on how happy they are. As for harvesting, just wait as long as possible before frost for the biggest roots. You can feel around and pull a few before then as a test... but you'll get the best harvest by waiting.